Back in January we learned that Remedy Entertainment, developers of Max Payne and Alan Wake, would be resurrecting their first ever PC game Death Rally for an iOS remake. Today, that new version of Death Rally [$4.99] went live in the App Store. I never played Death Rally when it came out in 1996, so my opinion of this remade version won’t be colored with knowledge of the original. 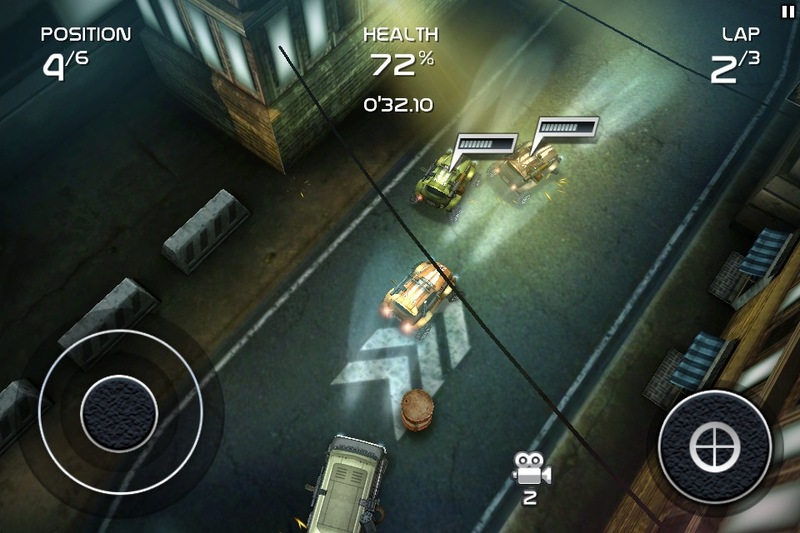 Approaching it as strictly a new iOS title, Death Rally is one of the finest top-down racers in the App Store. Death Rally isn’t perfect mind you, but it’s an absolutely gorgeous title with satisfying combat-heavy racing and an engaging upgrade system. The thing that sets Death Rally apart from most racers is its focus on combat. Each vehicle is equipped with a standard machine gun and a second stronger weapon of your choosing. These weapons, along with the vehicles beyond the first one, are unlocked by collecting items spread along the track while you’re racing. Money is earned with every race you enter, with more money awarded based on what place you finish, how many cars you destroy, and other performance factors. Your winnings go towards upgrading the 5 available vehicles in the game in the areas of speed, handling, armor, and weapons. Upgrading your cars and equipment is the real hook of Death Rally, and I was constantly wanting to play just one more race so I could fill up some more of my upgrade bars. The combat is also very satisfying, and there’s nothing better than blowing the snot out of the car ahead of you in order to surpass them and win a race at the last moment. Controlling your vehicle is slightly awkward at first. A virtual control stick is used for both acceleration and turning, and there is no brake button. This isn’t really necessary due to the arcade nature of the gameplay, but it caught me off guard at first. After just a few minutes though, I quickly warmed up to the controls and actually grew to really like them. 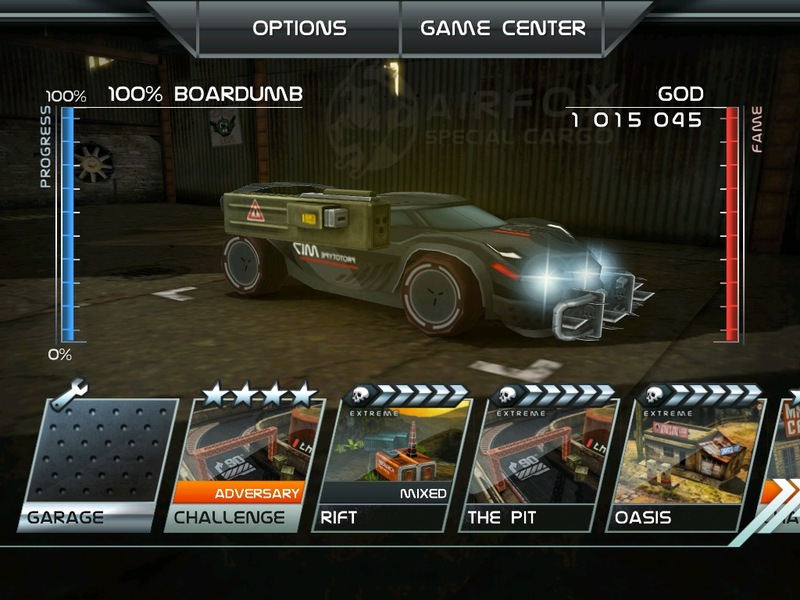 Death Rally offers 5 different tracks to race on, which doesn’t sound like a whole lot, but the game does a good job of maximizing the variety in them. Each track has a reversed version, a rotated version, and a combination of both providing 20 variations of the same 5 courses. There are also several types of race variations, and in a clever design move you always have 6 races to choose from, with those 6 options refreshing after each race. 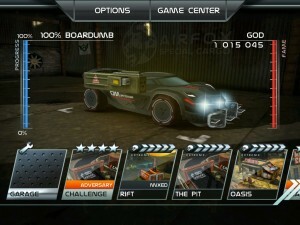 This ensures that there’s always something interesting to choose from in addition to the standard 6 vehicle race. The highlight of Death Rally is the fantastic visuals, with support for Retina Display devices and full screen anti-aliasing on the iPad 2. The levels are incredibly detailed, as are the vehicle models which display damage during the course of a race. When a race is finished you’ll get a close up view of your damaged vehicle in your garage and can watch it morph back to life when you repair it using your winnings, which is a cool effect. The visuals are made all the better by running at a rock solid frame rate throughout the game. It will take about 6-8 hours to play through everything in Death Rally, but once finished there’s not really a reason to come back unless you’re compelled to earn the 50+ achievements or improve your lap times on the Game Center leaderboards. More tracks, vehicles, and a multiplayer mode would greatly extend the experience, and Remedy has said that these things are all planned for future updates. For an initial release though, Death Rally still contains a good amount of content, and it’s a ton of fun to play through. There are a lot more positive impressions in our forums, and those looking for an action packed top-down racer would do well to check out Death Rally.